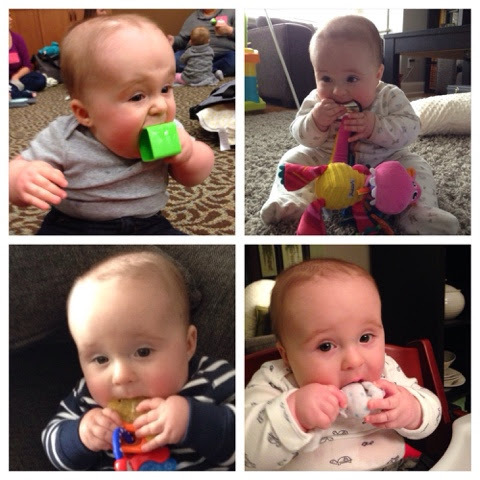 Ahhhh teething! And it goes on forever, lol! We use Tylenol and Ibuprofen (not at the same time) with good success. But I also really like the Homeocan teething drops – they are similar to the Camilia ones except they don't have any belladonna in them. We also have an amber teething necklace – I'm not sure if I notice a difference with it or not, but it can't hurt and it's pretty cute on! Thanks Brie! I'll have to try the Homeocan drops when the Camilia runs out. I totally forgot about our amber necklace! We had it on for a few weeks and didn't notice a difference so took it off. We'll try it again as we get deeper into this. I agree can't hurt and it's pretty cute.